After some time without news from RSSOwl, I am happy to release version 2.2.1. You will now find quick access to common actions like archiving or labeling right below the article content. Especially for articles with lots of content this means you no longer have to scroll all the way up to the title to run actions on the news. In addition, some broken keyword feeds have been fixed and new ones added. 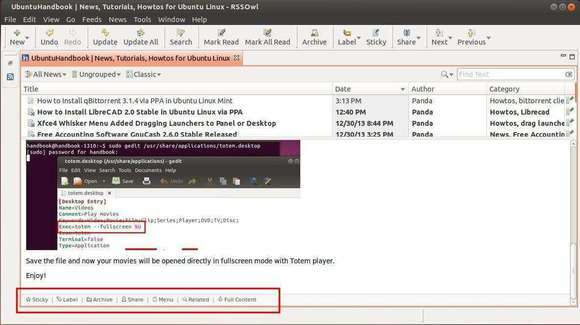 For Ubuntu user, download and double-click to install this deb. For Linux Mint user, there’s an option under Software Sources -> Additional Repositories -> archive.getdeb.net.